The income level that is three times the median household income for the preceding calendar year, as most recently reported by the Bureau of the Census (i.e., the income threshold set forth in 35 U.S.C. 123(a)(3) and (a)(4) ) is referred to as the "gross income limit" or the "maximum qualifying gross income." The Office’s micro entity status certification form PTO/SB/15A refers to the official Web page address providing the up-to-date maximum qualifying gross income. Each inventor and each non-inventor applicant (e.g., an assignee-applicant) must individually meet the gross income limit. The gross income limit applies to the assignee (if any) regardless of whether the assignee is identified as the applicant. Under 37 CFR 1.29(a)(4), the gross income limit applies to each party with an ownership interest in the application including any party(ies) to whom an ownership interest obligation is owed. Accordingly, each assignee, licensee, and inventor must individually meet the gross income limit. 37 CFR 1.29(a)(1)-(4) sets forth the requirements for establishing micro entity status on the gross income basis. If an application names more than one inventor, each inventor must meet the requirements of 37 CFR 1.29(a)(1)-(4) to file a micro entity certification on the gross income basis in the application. If the applicant is other than the inventor(s) (e.g., an assignee-applicant), then each such non-inventor applicant as well as each inventor must meet the requirements of 37 CFR 1.29(a)(1)-(4) to file a micro entity certification on the gross income basis in the application. If there is any assignee or licensee that received "ownership rights" from any inventor or non-inventor applicant, then the party(ies) with the "ownership interest" must also meet the gross income limit requirement. Because each inventor and each non-inventor applicant (e.g., assignee-applicant) must separately meet the requirements under 37 CFR 1.29(a)(1)-(4), it would not be appropriate to file a micro entity certification under 37 CFR 1.29(a) for the application if there were more than one applicant or inventor and not all of the applicants and inventors qualified as micro entities under 35 U.S.C. 123(a): e.g., (1) an applicant or inventor exceeded the gross income limit; (2) an applicant or inventor had more than four other nonprovisional applications; or (3) an applicant or inventor had assigned, granted, or conveyed the application or was under an obligation to do so, to an entity that exceeds the gross income limit. Additionally, the gross income limit under 35 U.S.C. 123(a)(3) applies to each applicant’s and inventor’s income separately (i.e., the combined gross income of all of the applicants and inventors need not be below the income level in 35 U.S.C. 123(a)(3) ). Further, the assignment requirement in 37 CFR 1.29(a)(4) applies to each applicant and inventor (i.e., if an applicant or inventor assigns or is obligated to assign the invention to more than one assignee (e.g., half interest in the invention to two assignees), each of the assignees must meet the income limit specified in 37 CFR 1.29(a)(4) ). Note also that in this context an inventor ordinarily should qualify as a small entity under 37 CFR 1.29(a)(1) and 1.27(a)(1). Under 37 CFR 1.27(a)(1), an inventor generally is a small entity and retains such status even if the inventor assigns some rights to another small entity. Similarly, to obtain micro entity status, 37 CFR 1.29(h) requires that any non-applicant assignee be a small entity. The Office’s form PTO/SB/15A contains the certifications under 37 CFR 1.29(a)(1)-(4) that are required to establish micro entity status on the gross income basis. The form refers to the certification requirements as: (1) Small Entity Requirement, (2) Application Filing Limit, (3) Gross Income Limit on Applicants and Inventors, and (4) Gross Income Limit on Parties with an "Ownership Interest." 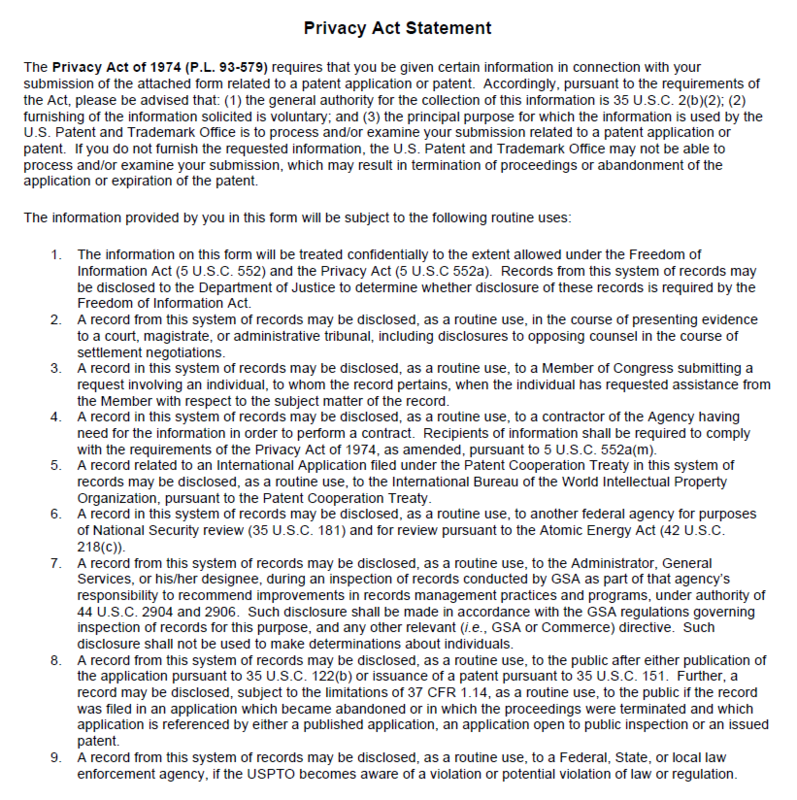 For purposes of establishing micro entity status under the "gross income" basis, the application filing limit as set forth in 37 CFR 1.29(a)(2) includes: (i) previously filed U.S. nonprovisional applications (e.g., utility, design, plant, continuation, and divisional applications), (ii) previously filed U.S. reissue applications, and (iii) previously filed U.S. national stage applications under the Patent Cooperation Treaty (PCT). All such applications naming the inventor or a joint inventor are counted toward the application filing limit, whether the applications were filed before, on, or after March 19, 2013. Further, it does not matter whether the previously filed applications are pending, patented, or abandoned; they are still included when counting to determine whether the application filing limit has been reached. Because the four application limit is a limit on previously filed U.S. nonprovisional applications, reissues applications, and national stage applications, the maximum number of applications in which fees can be paid at the micro entity discount rate can vary from 0 to 5 for any given inventor. For example, consider a person named as a sole inventor in five previously filed U.S. nonprovisional patent applications in which all ownership rights have remained with the sole inventor (i.e., no assignment or licensing of patent rights ever occurred). This person was not named as an inventor in any other application. Because all five applications count against the application filing limit, this person cannot be named as an inventor in any future-filed application entitled to micro entity status on the "gross income" basis under 37 CFR 1.29(a). (However, the filing of a future sixth application will not jeopardize entitlement to micro entity status in any of the five applications already filed.) If the first two of the inventor’s five applications went abandoned prior to March 19, 2013, then the inventor would not have had the opportunity to pay fees at the micro entity discount rate in those two applications. (The micro entity discount became available for the first time on March 19, 2013.) However if the third-filed application issued as a patent, then for purposes of paying maintenance fees, the applicant-turned-patentee (the sole inventor in this example) may establish entitlement to micro entity status on the "gross income" basis if all 4 requirements under 37 CFR 1.29(a) are met. If the fourth and fifth filed applications are still pending, then similarly, the inventor may establish entitlement to micro entity status on the "gross income" basis if the four requirements under 37 CFR 1.29(a) are met. For purposes of qualifying for micro-entity status under 37 CFR 1.29(a) and paying fees at the micro entity discount, it is required that no inventor had a gross income exceeding the gross income limit in the calendar year preceding the time of fee payment. This gross income level requirement also applies to any applicant who is not an inventor (e.g., an assignee-applicant). 35 U.S.C. 123(a)(3) and 37 CFR 1.29(a)(3) define the gross income limit as "three times median household income for [the] preceding calendar year, as most recently as reported by the Bureau of the Census." Based on that definition, the gross income limit is reported on the USPTO website at www.uspto.gov/patent/laws-and-regulations/ micro-entity-status-gross-income-limit as the "maximum qualifying gross income." At the time any fee is to be paid in the micro entity amount, it is required that no inventor and no non-inventor applicant (if any) have a preceding calendar year’s gross income exceeding the "maximum qualifying gross income" posted on the USPTO website. It should be noted that "gross income" means total income. "Gross income" and "adjusted gross income" are not the same thing. Adjusted gross income is defined as gross income minus adjustments to income. For purposes of micro entity status it is "gross income" – not "adjusted gross income" that matters. Section 61(a) of the Internal Revenue Code of 1986 (26 U.S.C. 61(a)) provides that: "[e]xcept as otherwise provided in this subtitle, gross income means all income from whatever source derived, including (but not limited to) the following items: (1) Compensation for services, including fees, commissions, fringe benefits, and similar items; (2) Gross income derived from business; (3) Gains derived from dealings in property; (4) Interest; (5) Rents; (6) Royalties; (7) Dividends; (8) Alimony and separate maintenance payments; (9) Annuities; (10) Income from life insurance and endowment contracts; (11) Pensions; (12) Income from discharge of indebtedness; (13) Distributive share of partnership gross income; (14) Income in respect of a decedent; and (15) Income from an interest in an estate or trust." With the coming of each new year, the "preceding calendar year" advances, and anyone’s preceding calendar year’s gross income may change as a result. Therefore, if the prosecution of an application under micro entity status extends across multiple calendar years, each applicant, inventor, and joint inventor must verify that the gross income limit for the requisite calendar year is met to maintain eligibility for the micro entity discount. If the gross income limit is no longer met, then a notification of loss of entitlement to micro entity status must be filed in the application to remove micro entity status. On the other hand, it is possible a small entity applicant not meeting the gross income limits specified in 37 CFR 1.29(a)(3) and (4) in the calendar year in which the application was filed could meet the 37 CFR 1.29(a)(3) and (4) gross income limits in the calendar year in which the issue fee is paid, for example, due to a reduction in income. However, the applicant must still be a small entity at the time of issue fee payment, and the applicant must have met the application filing limit under 37 CFR 1.29(a)(2) when the application was filed. The applicable "maximum qualifying gross income" that is reported on the USPTO website at www.uspto.gov/patent/laws-and- regulations/micro-entity-status-gross-income-limit is anticipated to change (increase or decrease) in September or October of each year. If the reported "maximum qualifying gross income" increases, then parties that met the gross income limit earlier that calendar year will continue to meet the gross income limit for the rest of the calendar year. There may also be additional parties that meet the gross income limit. If the reported "maximum qualifying gross income" decreases, however, some parties that met (e.g., barely met) the gross income limit earlier that calendar year might no longer meet the gross income limit for the remainder of the calendar year. In that event a notification of loss of entitlement to micro entity status must be filed as fees could not be paid in the micro entity amount in the relevant patent application or patent for the remainder of that calendar year. For inventors who file tax returns jointly with their spouse, for example, determining the inventor’s gross income may not be readily apparent from the preceding calendar year’s joint tax return. Regardless of whether any inventor, or any person who is a non-inventor applicant (e.g., assignee-applicant), or any person with an "ownership interest" under 37 CFR 1.29(a)(4) actually filed a joint tax return rather than a separate tax return in the preceding calendar year, the gross income limit applies to the amount of income the person would have reported as gross income if that person were filing a separate tax return, which includes for example, properly accounting for that person’s portion of interest, dividends, and capital gains from joint bank or brokerage accounts. For filings on behalf of deceased inventors, gross income from the deceased inventor’s estate or trust does not count toward the gross income limit because the trust or decedent’s estate is considered a separate legal entity. However, the deceased inventor’s legal representative acting on behalf of the deceased inventor under 37 CFR 1.43 is an "applicant" in terms of 37 CFR 1.29(a). Therefore the legal representative’s gross income in the preceding calendar year cannot exceed the gross income limit under 37 CFR 1.29(a)(3) in order to qualify for micro entity status. 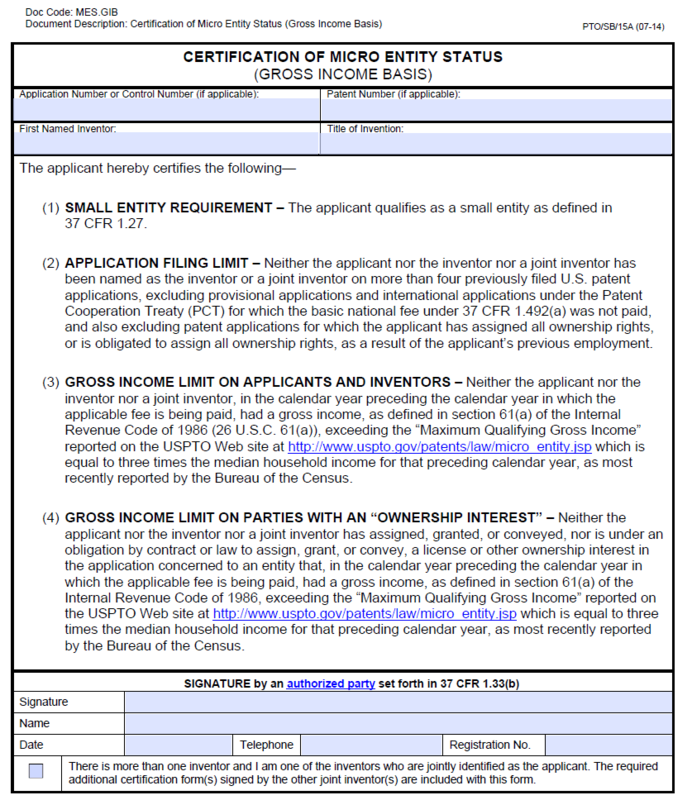 For example, if the deceased inventor has a surviving spouse who is named on the Application Data Sheet (ADS) as an applicant by virtue of being the legal representative of the deceased inventor, the surviving spouse’s gross income in the preceding calendar year cannot exceed the gross income limit in order to qualify for micro entity status. On the other hand, if the deceased inventor had assigned all rights in the application (or if subsequent to the inventor’s death, the legal representative assigned all rights in the application) AND the assignee that received all rights was named as an applicant (or the applicant), then it would be the assignee that would have to meet the gross income limit (under 37 CFR 1.29(a)(4) ) and not the legal representative. In any event, each other joint inventor, assignee, and licensee (if any) would also have to meet the gross income limit in order to qualify for micro entity status. D. Gross Income Limit on Parties With an "Ownership Interest"
Pursuant to 37 CFR 1.29(a)(4), the gross income limit extends to any party with an "ownership interest" from any applicant or inventor. Accordingly, for each inventor, applicant, and party with an "ownership interest," gross income in the calendar year preceding the time of fee payment must not exceed the "maximum qualifying gross income." Thus, the gross income limit applies to the assignee regardless of whether the assignee is identified as the applicant. For micro entity status, 37 CFR 1.29(a)(4) requires that the gross income limit be met by each assignee and licensee (if any) as well as by each inventor. If prosecution of an application that is under 37 CFR 1.29(a) micro entity status extends into a new year, it is important to verify that no inventor, no non-inventor applicant, and no party with a 37 CFR 1.29(a)(4) "ownership interest," had a gross income in the new preceding calendar year that exceeds the "maximum qualifying gross income" reported on the USPTO website. If the coming of a new year results in the gross income limit not being met by any inventor, applicant or party with a 37 CFR 1.29(a)(4) "ownership interest," then a notification of loss of entitlement to micro entity status under 37 CFR 1.29(i) must be filed in the application to remove micro entity status. 37 C.F.R. § 1.29 Micro entity status. Section 1.29(c) implements the provisions of 35 U.S.C. 123(c). Section 1.29(c) provides that if an applicant’s, inventor’s, joint inventor’s, or entity’s gross income in the preceding calendar year is not in United States dollars, the average currency exchange rate, as reported by the Internal Revenue Service, during that calendar year shall be used to determine whether the applicant’s, inventor’s, joint inventor’s, or entity’s gross income exceeds the threshold specified in 37 CFR 1.29(a)(3) or (a)(4). The Internal Revenue Service reports the average currency exchange rate (Yearly Average Currency Exchange Rates) on its Internet website (www.irs.gov/Individuals/International-Taxpayers/ Yearly-Average-Currency-Exchange-Rates ).